Marc Andreessen once famously noted: “Google is working on self-driving cars, and they seem to work. People are so bad at driving cars, that computers don’t have to be that good to be much better.” So when can we push a button and be picked up by a driverless vehicle? The answer is, I don’t know. So let’s find out with a deep-dive into the world of mobility services and interview BESTMILE‘s Raphaël Gindrat. 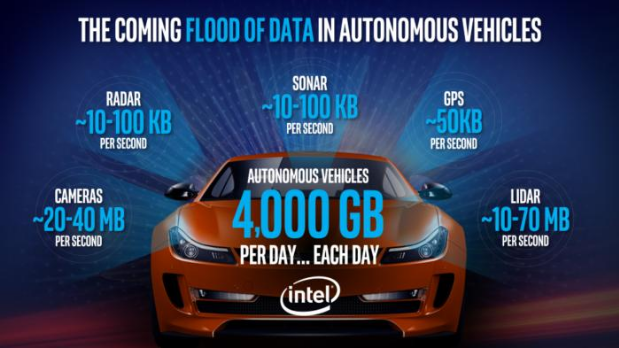 According to Intel’s CEO Brian Krzanich, autonomous vehicles will generate and consume roughly 40 terabytes of data for every eight hours of driving. 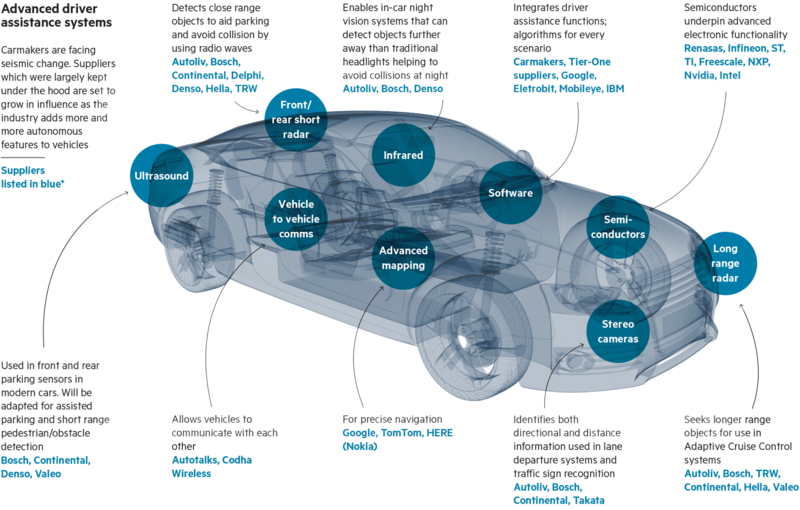 The averagely driven car will churn out 4,000 GB of data per day, as it is equipped with hundreds of sensors. Cameras alone will generate 20 to 40 megabyte per second, and the radar, as well as sonar, will generate between 10 and 100 kilobytes per second. Thus the worlds of tech companies and traditional automotive manufacturers are colliding to shape the future of mobility, in which autonomous driving technology replaces humans and turns our cars into mobile server rooms. Before we dig deeper into the driving technology, let’s agree on a common terminology. The Society of Automotive Engineers (SAE) International has defined six levels of automation – from no automation (Level 0) to full automation (Level 5). These base definitions describe categorical distinctions for a step-wise progression through the levels and are consistent with current industry practice. 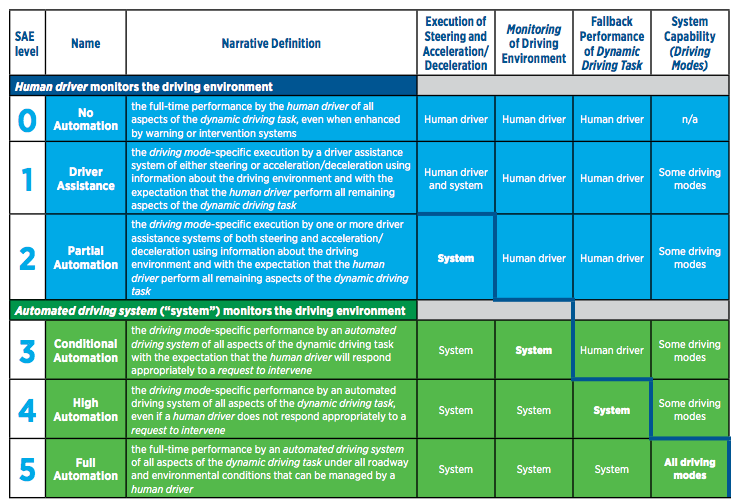 The key difference between Level 4 and Level 5 autonomous vehicles then is that the former allows — but does not need — a human to take over, while Level 5 vehicles prohibit human intervention. Google’s self-driving technology WAYMO aims for Level 5. According to Google’s website, their technology accumulated the equivalent of over 300 years of human driving experience, largely on city streets. That’s on top of 1 billion simulated miles that Google drove in 2016 alone. In other words, each self-driving car that is equipped with Google’s technology will have hundreds of years of driving experience the moment it starts operating. And the learnings of all vehicles will be shared across the entire fleet, resulting in an exponential growth of driving experiences. So Marc Andreessen might have a valid point after all. 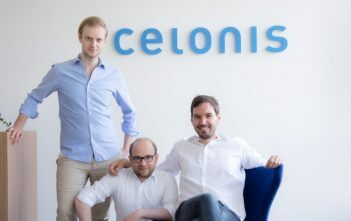 As we see above, this transformation comes in stages, requires significant investments and offers a huge market potential for the emerging ecosystem. 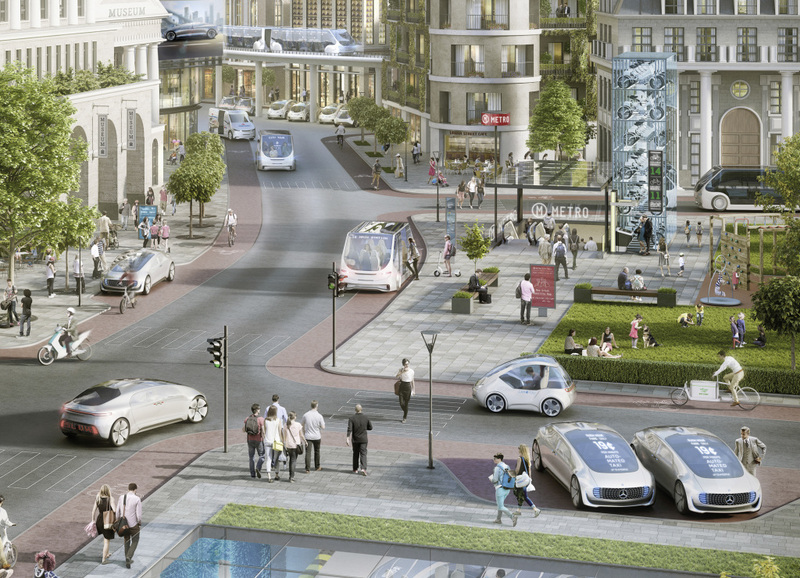 Roland Berger forecasts that by 2030, the new opportunities from autonomous driving will amount to USD 40-60 bn. This includes hardware components, such as cameras, sensors, communication systems as well as software that replaces decision making (machine learning) and navigation. As there would no longer be active human input for vehicle functions, highly precise and real-time information of a vehicle’s location and its surrounding environment will be required (e.g., road signs, pedestrian traffic, curbs, obstacles, traffic rules). Advanced concepts based on Artificial Neural Networks (unsupervised/deep learning, machine learning) will be needed to create systems to detect, predict and react to the behavior of other road users, including other vehicles, pedestrians, and animals. Detailed and complete maps must be available to provide additional and redundant information for the environmental models that vehicles will use for path and trajectory planning. A self-adapting interface with a smooth transition of control to/from the driver, mechanisms to keep the driver alert and a flawless ride experience will be instrumental in winning consumer confidence. Traditional OEMs have started to develop theses capabilities in-house, but also acquire them externally or through partnerships. Which is why incumbent players today simultaneously compete on multiple fronts and cooperate with competitors. New market entrants are positioning themselves to provide high-margin activities along the value chain and suppliers will increase their bargaining power in the years to come. Of course, traditional OEMs will do everything they can to ensure that tech conglomerates and software start-ups don’t dominate the future of mobility. They see the threat of being reduced to a sole vehicle supplier. Which is why it is fascinating to watch, how the competitive forces are reshaping the automotive industry and to identify the beneficiaries of novel business models and revenue streams for mobility services. 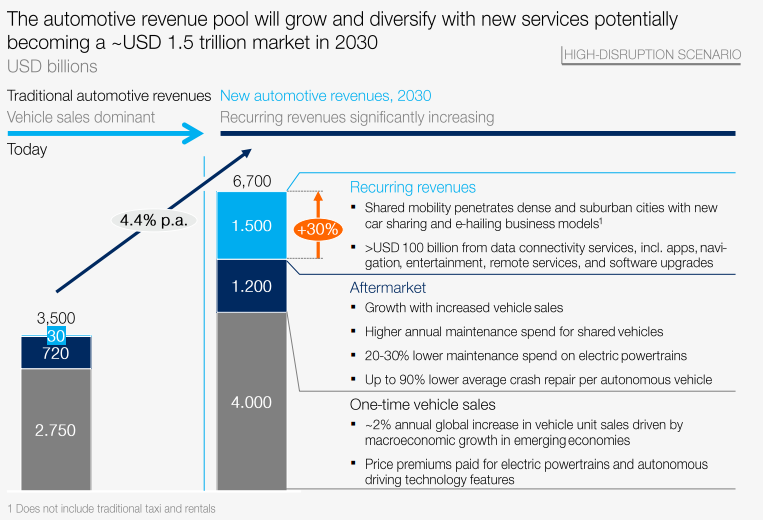 McKinsey estimates that rideshare and onboard data services could generate an additional USD 1.5 trillion of annual automotive revenue by 2030, adding to the USD 5.2 trillion from traditional car sales and services. Connectivity and later autonomous technology will increasingly allow the car to become a platform for drivers and passengers to use their transit time for personal activities, which could include the use of new forms of media and services. The increasing speed of innovation, especially in software-based systems, will require cars to be upgradable. It is financially attractive for consumers too: It costs an average of USD 8,558 per year to own a car in the U.S., but each vehicle is used just 4 percent of the time. Ridesharing in an autonomous vehicle could ensure that cars are always in use. And the global market for mobility services is growing, too. According to Statista, the total market volume can be divided into four service categories: flights, car rentals, trains and buses, and ride sharing. Comparing worldwide figures, it can be acknowledged that most of the revenue is generated in the United States (USD 127.4 billion), followed by Europe with a revenue of USD 94.3 billion and China with USD 54.7 billion in 2016. 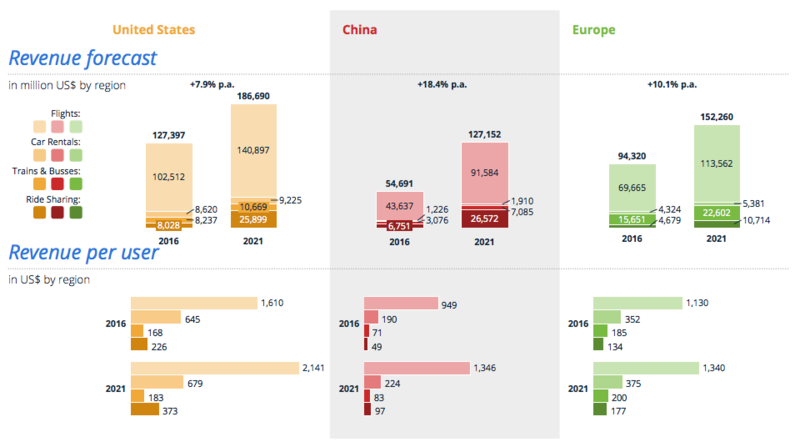 Until 2021, all markets are forecasted to grow significantly with annual growth rates of 18.4 percent (China), 10.1 percent (Europe) and 7.9 percent (United States). Now if we subtract the revenue share of flights, which is a market segment unlikely to compete with autonomous vehicle services, we arrive at a total global market volume of USD 120 billion forecasted for 2021. The capability to optimize the fleet operation of autonomous vehicles will be a critical competitive advantage for the mobility service providers in the future. 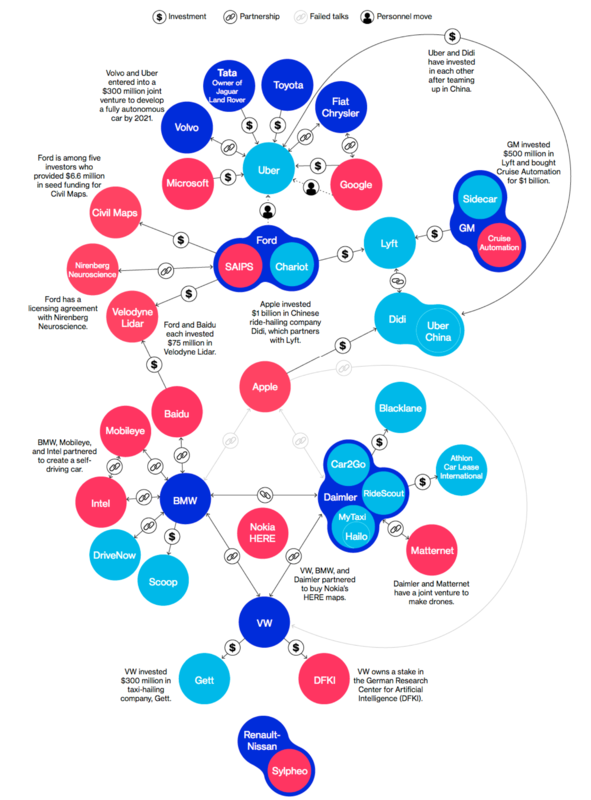 In the past years, new players have entered the global markets with UBER, DIDI and LYFT being the most prominent start-ups. 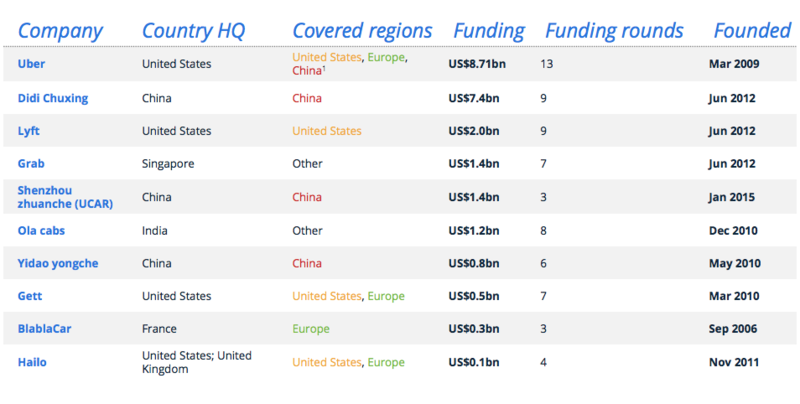 The 10 largest companies managed to attract a total funding of USD 22.4 billion. And the intensity of competition is further increasing. 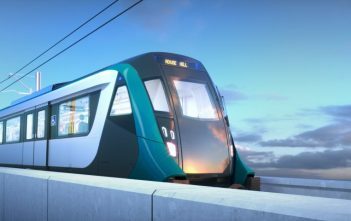 So today, commercially operating autonomous vehicles are rather small shuttles that are replacing bus routes and run at speeds of up to 25 km/h in well-defined areas. However they are real, they run and these projects help all market players to learn and advance the technology. For traditional cars, advanced driver assistance systems will accelerate the transition from humanly operated to self-driving vehicles in the next years. 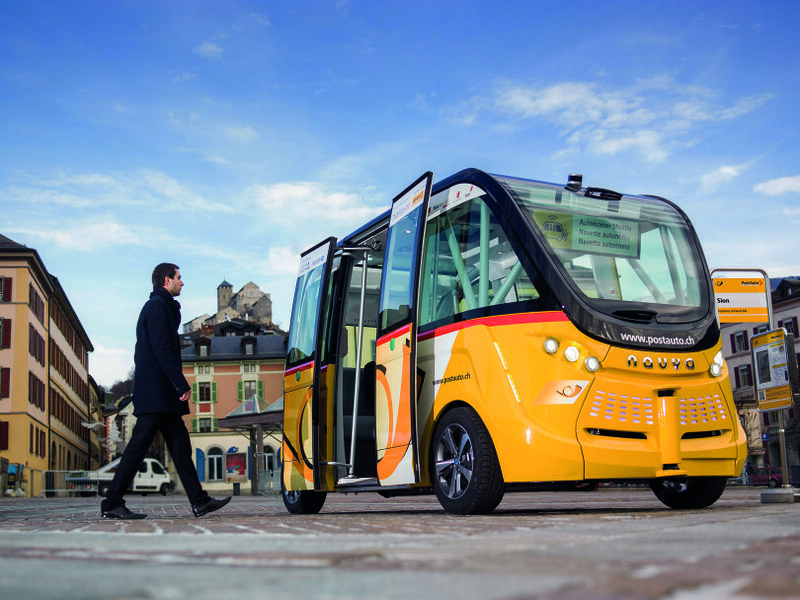 In the years 2025 to 2030 will see a convergence of mobility service providers and the deployment of large fleets of autonomous vehicles replacing taxi, bus and trams drivers in cities across the globe.